I have been admiring this most beautiful day from afar all day today and am overjoyed with the international press coverage also. "and for at long last I sensed that yes, we may be able to finally get rid of Chavez, without necessarily spilling bloodshed"-That is the one miracle I am hoping for. The hole in the dike. I'm not surprised. It just has been very hard to see through our own fears. They feed the G2 Gestapo-style psychoterror campaign that has used the media and every conceivable trick to try to numb us into inaction. But it didn't work. Venezuela showed them, again, yesterday. The millions of democrats in this country have decided that it has been enough, that it will end peacefully and that it will end now. 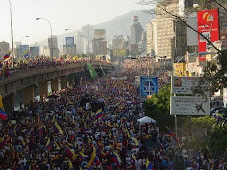 There is nothing the castrochavistas, the G2 or the few thugs that benefit from this mess can do to stop us.
" Abajo Cadenas" Ya es una realidad. "For once the regime did not try to sabotage it"
Oh, I'm sure they were supposed to have tried. But chavistas aren't known for their bravery when outnumbered and unable to use their guns. The fact that they couldn't get their people to disrupt the march says a lot more about how over this nefarious regime is that the size of the march itself. Better ensure that each and every polling station is covered. Bailoterapias are great for catharsis, but that's about it. Chavez's hand has to be forced. Marchas do not cut it. Citando a Alonso Moleiro, "la marcha de ayer (fue la de) un pais movilizado contra la violencia, el abuso de poder, el sectarismo y la corrupciòn". No fue por un candidato incómodo, impuesto a juro por un sector de la oposición, como las marchas que aparecen en sus fotos. Aprendimos de los errores, hemos dejado atrás el pasado, los miedos y rencores. Ayer no hubo bailoterapia Sr. Boyd. Ayer se palpó una voluntad férrea e irreversible de triunfo. En todas partes. Sin lugar a dudas. Voluntades ferreas e irreversibles de triunfo no tumban dictaduras Maria, de la misma forma que deseos no preñan. 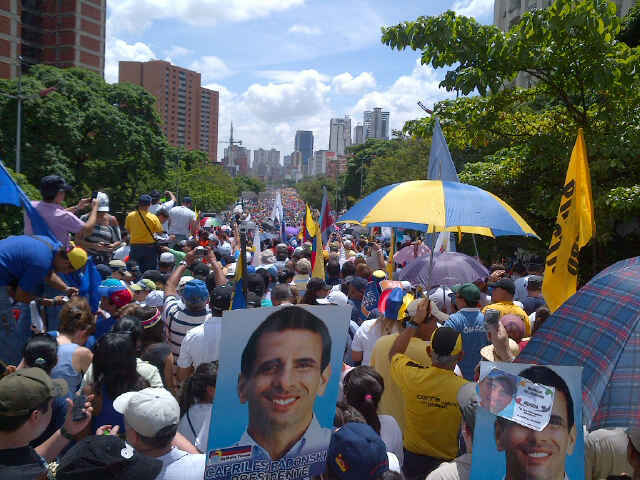 Y desde luego que los cientos de miles de venezolanos que asistieron a las marchas de Rosales en el 2006 no parecian en lo absoluto incomodados por la imposicion del candidato por un sector de la oposicion, el mismo, dicho sea de paso, que acompaño a Capriles al CNE. Asi que dejen de creer en pajaritos preñados de una bendita vez, agarren esa dizque voluntad ferrea e irreversible y asegurense de que todas y cada una de las mesas en todos y cada uno de los centros de votacion cuenten con testigos. I've been getting the distinct sense that AB doesn't vote. Please correct me if I'm wrong. ¿Y de dónde cree Ud. que van a salir los voluntarios para los centros si la voluntad de triunfo no es férrea? No entendió nada Sr. Boyd. No te escondas, Alek. Sé que estás flotando por ahí. Contesta, vale. Tu votas? Just trying to get a sense of your civic investment, for all the rain you bring to discussions. Si mal no recuerdo, el Sr, Boyd escribió en su blog no hace mucho que, si ganaba Capriles en las primarias, votaría por chavez para que nos lo tuviéramos que calar 6 años más, y así darnos a todos una lección. A todos los que creemos en pajaritos preñados, digo. Espero que nos estés tomando el pelo, María. "Sin justicia no hay paz, y sin paz no hay reconciliación posible. Eso lo deberian saber los intelectuales de pacotilla, como Petkoff y sus admiradores. Irónicamente, Petkoff también es lo que puede calificarse como un "dinosaurio de la cuarta república", esa que tanto detestan los 'progres'. Desde luego que yo no voy a darle mi voto a Capriles Radonsky si éste gana las primarias. Prefiero votar por Chavez, a ver si en los próximos seis años les llega la madurez a algunos de los pusilánimes adolescentes que están compitiendo en las primarias." "a ver si en los próximos seis años les llega la madurez a algunos de los pusilánimes adolescentes que están compitiendo en las primarias." guau, María. Dicho por quien ha mostrado *tanta* maduréz (Ken Livingston), preparación intelectual sin precedente (M.A. merits sin BA), y cubierta psicológica para canalizar las rabietas. Great turnout!!!! My thoughts and prayers are with all of you that you may see a change. It seems like the chances are the greatest they have ever been. I had many friends that walked yesterday and told me that the you drown in the sense of emotion and hope everyone in the crowd was feeling!!!!! Daniel....Alex brings up a good point. "For once the regime did not try to sabotage it"....maybe they used yesterday as a great recon mission to see what the opposition could truly mobilize. Now they can use this info/numbers to see how bad the voter fraud has to be or what other actions they can take to ensure they steal the election or even have one. Their back is against the wall and they will used WHATEVER it takes to hold on. Its obvious that the oppo is doing a amazing job and I'm sure they will continue....but they have to have a rock solid plan to defend the votes. Without it they will steal the election like they have stolen all the countries resources for the last 13 years. EXPECT THE BEST...PLAN FOR THE WORST!!!!! God Bless All of you in your fight!!!!!!! Damn it Alek you are always right. Per usual, the BBC puts a subtle, yet positive spin on Chavez's situation. They seem to forget that the truth is not necessarily just a personal, and biased selection of facts.Battle not yet won.I think it extends way beyond Chavez. Show me a country that knows how to party and I will show you a free country. Chavez,for example doesnot know how to party, who to party with, and where to party. For example- who wants to party with bloody dictators?Quadaffi-want to party with him. NO! Mugabe-want to boogie with him. NO!Raul-NO!